Majestic! Epic! Spectacular! ...so the advertisements state. Admittedly, it’s been a very long time since I read the book. But it doesn’t require a lack of recollection to realize that splitting The Hobbit into three movies is either mining new depths of greed or a victim of hubris. Or both. Actually, I liked the movie about a hobbit. Whenever Bilbo, superbly cast with Martin Freeman, is in a scene, you understand why they made a movie about him. He relates to us. He’s the average guy called upon for a quest, and he grows in boldness and strength beyond his diminutive stature, even by the end of Part One. Also, the guessing game with Gollum is particularly well done. You hate him, but you’re glad to see him, too. Also well done are the few extra liberties taken to tie this series with LOTR. But, I’m not confident going into the next movies, regardless of how splendid a single dragon eye appears at the end of the movie. But I am thankful for Bilbo (and Gollum) for salvaging a film from its own majestic, epic, spectacular excesses. Thorin Oakenshield, wannabe Dwarf King. Remember Gimli from Lord of the Rings? Rather bulbous, ugly dude, right? Regrettably, the producers instructed casting to find another Aragorn to play the lead. A rather dashing dwarf, really. All of dwarfdom rejoices that their DNA is trending towards Germanic fine features. In fact, he looks so normal, that it’s shock to find out that he’s diminutive in the few scenes with those tallish humans. Bad. Really bad. What’s the message here, kids? If you don’t have a leading man face, you can’t play the hero. 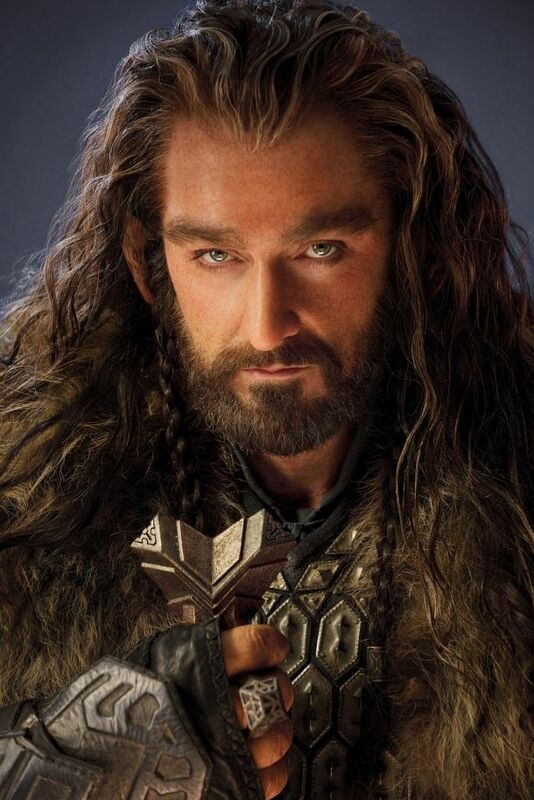 Not that Thorin has yet proved himself one. Worse: Who decided dwarves would be relegated to comedy relief? Do they have any skills at all? The plate throwing tantrums at Bag End at the movie’s onset set the expectations for the film. See a dwarf in a scene? Let the lampoons begin. Great and lousy special effects. Battle scenes? Aces. A group of dwarfs beholding the majesty of Rivendell? Put them all on the stage and hope the digital artist makes it look like they’re somewhere else. Really bad. Suspension of disbelief. Remember how Indy jumped out of a falling airplane in a raft, landed on the top of an ice packed mountain, missed all the trees on the slopes, then fell a half mile to the river below and woke up in the tropics? Here you go again. It begins with small steps... like those of a band of dwarves and a hobbit skirting along (dark, moist, ancient) ledges high in the mountains. One slip? No problem, silly hobbit. Let the mountains come literally alive, though, and physics are found... inconvenient. Forget inertial forces, friction, falling boulders of mountain beings, and, well, that should be expected when mountains decided to duke it out. I’m guessing there’s something ferrous in those hills, and our party was gifted with magnetic boots bequeathed by Galadriel in a scene cut for fear of making the movie too long. Sorry, there should be dwarf guts splashed all over them thar hills. I also don’t remember dwarves being adept at scampering up trees. They’re mountain people, as far apart from elves as possible. Except when it’s written into a plot. But, to be fair, they were painted into a corner. It’s not uncommon, of course, for a band of heroes to escape certain death whilst fighting multitudes. LOTR did that with aplomb. Aragorn and company were, however, skilled at war craft and heroic in their grit. This band of 13 dwarves are better suited as stooges at an Orc cooking session. Running through a gazillion goblins swing blades and shooting arrows without any mishap? Quite easily done. After all, they’re needed for two more movies, regardless of Tolkien’s intentions. And, then there’s the aforementioned Indiana Jones scene. Don’t you hate it when you’re fighting hordes and your whole bridge section gives way? Yeah, me too. But, in the hands of special effects artists, a half mile free-fall plunge is just an opportunity for a majestic, epic, and spectacular opportunity to pin the section between rock faces, bringing our intrepid crew to a mildly jarring but fully horizontal halt. Not worth losing one’s footing, really. All in a day’s work. This isn’t a work of fantasy, it’s a cartoon featuring Wile E. Coyote. Actually, by that point in the movie, it’s already demonstrated that falling significant distances is but a trifle for short and stouts. By the way, Gandalf? Love ya, and it’s good to see so much more of ya, but... You’re not getting out of this underwhelming narrative either. When you whisper to a butterfly to tell him that he should pass a message to the giant eagles for a last minute rescue? That butterfly should really flit away at warp speed. Though, I can see why you’re not too worried. If your tree breaks and the party free-falls another cliff face, there’s probably a giant sponge at the bottom to catch you. So never mind. (But, just between us? That little “stun the army” spell might have actually been helpful at Moria, Helm’s Deep and the gates of Mordor. Just sayin’). But, never mind all that. We didn’t arrive to pick on the movie. We came with majestic, epic, and spectacular expectations! And we loved it despite cringing for all the wrong reasons.